Portobello. Not the mushrooms, not the street market, but Porty, Edinburgh. Where the “99 ice-cream” was invented (allegedly). Portobello, Edinburgh’s Seaside, and now soon to be home of the world famous Porty Light Box. 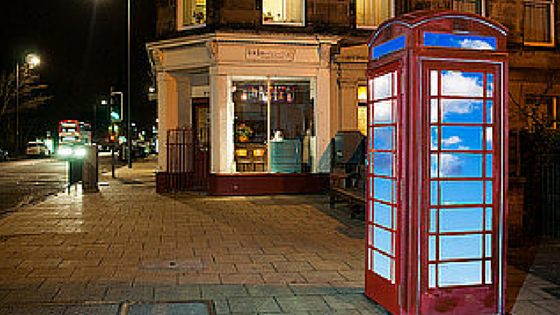 The Porty Light Box is a decommissioned BT phone box, adopted by the local community. For the telephone kiosk aficionado’s amongst you, it’s an iconic “K6” design; loved by many, ignored by all. It’s just a part of the street furniture, but BT provides local communities with the option to adopt decommissioned kiosks and do with them what they will. Well, we’ve adopted ours, possibly the only adoption in a UK city and we’ve started to strip down the old paint work ready to renovate it in the spring. Thanks to the guys at Spacehive we had a brilliant funding campaign before Christmas where we raised over £1500 to buy paint, glass, internal lights and other materials to convert the kiosk into an art display cabinet or “light box”. Create a Facebook Page (not a Timeline) for your project and get a ‘vanity URL’ for it. This is so you can easily promote your Page by using www.facebook.com/yourprojectname. Next, link it up with your blog, Twitter, LinkedIn or whatever social media you’re using – the idea is to make it easy for yourself – make one post, say on your blog, and have it repeated automatically on all your other accounts. Get some business cards made up to hand out to people with the basic project information and contact details – including your vanity URL; the cards are great to hand out to people you might meet and talk to about your project. Make a note of all your passwords for all the various accounts you use – Spacehive, PayPal, Facebook, GoCardless, blog, email – they all add up! You might need to open a dedicated bank account to receive your project funds – most banks provide free ‘Treasury Accounts’ for community groups and charities. These types of accounts need two signatures for any cheques that are written, which is a good for financial transparency. Whilst you’re setting up your Spacehive Project Page start posting updates on Facebook and start getting your friends to click ‘Like’ on your Page and to share it. When you’re ready to launch, fire off a few emails to close friends and family asking them to be ready to pledge early – other people are more likely to pledge if they see that other people already have – and to pledge some low amounts too so everyone – whatever their background – can feel they can contribute. When you launch, share the link to your Spacehive project page on your Facebook page, blog, email etc. Your aim is to direct everyone to your Spacehive project page – after every tweet, status update or blog update, include a link to your Spacehive page. Our campaign was a combination of word of mouth, emails to friends and by using Facebook. We spent one afternoon walking up the local high street handing out flyers and talking to shops and businesses, asking for pledges. Depending on your project, you might be able to offer businesses something in return for donations. Chris and his team also helped by putting us in touch with the local press, which helped raise our profile. We were amazed at the generosity of local people and businesses. Most pledges were local but word spread as far as Australia, with messages of support from the US as well (hence my earlier assertion at being world famous). Spacehive really made it easy to spread the word using social media and also to collect the donations. Don’t forget to post updates when milestones have been reached or when people have pledged. We’re really looking forward to the spring and once the Porty Light Box is created, we’ll update you again. If you’re visiting Edinburgh in the summer, be sure to drop by Porty and have a look around. Oh, and grab yourself a 99.